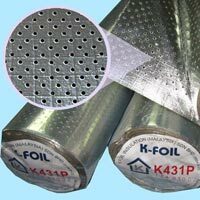 We are offering sound dampening insulation backing foil. Perforated series: heavy duty aluminium foil. Perforated series: medium duty aluminium foil. - Reinforced with special fiberglass scrim for better product strength. Perforation with small openings (2.5mm dia.) to avoid glass wool from passing through. Diamond shape of perforation pattern to optimize strength and will reduce risk of continuous tear off in case of damage.